special size is also available. materials, petrochemicals, non-ferrous metal industries. CCEWOOL Ceramic fiber cutting module was made of our self-produced ceramic fiber blanket through automatic production line. The daily output is up to 5000 pieces which can guarantee a timely delivery. Producing various shapes’ ceramic fiber module. Installation instruction can be provided. As the result of shared cognition of the importance of constant quality, we won the most famous refractory material manufacturer and supplier in Turkey as our agent. Now, our agent has dominated ceramic fiber market in Turkey and also has some influence in Middle East area for the past 5 years of being CCE WOOL agent. Our Turkey agent is a famous family-run company, which was founded in 1978, producing mainly unshaped refractory material. Their main business includes various refractory materials retails and furnace construction. They used to order ceramic fiber materials from some other Chinese suppliers, but they were bothered by the un-prompt sales service, un-flexible lead-time and unstable quality etc. in the past cooperation. On 2009 Ceramitec Munich fair, as the only ceramic fiber products manufacturer from china, Double Egret attracted extensive attention, our Turkey agent also noticed us on this fair. After some brief communication, they were attracted by our green package, superior quality and fast lead-time and placed order to us on the spot. After establishing business relationship, our agent was touched by our devotion to this job. Even though there is a 7 hours’ time gap between China and Turkey, we always managed to answer their question and provide effective solution before they went off work. “Even through, Double Egret and we have 7 hours’ time gap, their responses are faster than our local suppliers” that’s what they commented on us in the email. Now, the Turkish agent has become one of our earliest and most loyal customers, because they think we are quick and flexible in lead time, easy to work with in cooperation. Besides, we can also provide both competitive price and most important some referential advice for their furnace construction. In 2011, ceramic fiber market in Turkey went into a mess of unfair competition, our Turkey agent’s sales were heavily affected. Despite of the bad ceramic fiber market situation and reduction of sales, our Turkish agent and we insisted on guaranteed quality and rejected to do as others do. All our insistence on principal was paid back next year. After the recovery of Turkish market, for its being honest in the depression, CCE WOOL ceramic fiber became more popular in Turkey, won some new customers and got favorable comments in this industry. When Rosen Peng met with the manager of our agent in Turkey in METE Dusseldorf in 2011, they had some in-depth communication and reached a consensus that they and Double Egret had the same principal in running a company, So they proposed a more comprehensive cooperation in the future, they asked us to be our CCE WOOL ceramic fiber brand agent, and faced the future challenge together. In 2012, we came to attend the Ankiros in Turkey with our CCE WOOL ceramic fiber products including ceramic fiber blanket, ceramic fiber board, ceramic fiber module, ceramic fiber paper, ceramic fiber rope, ceramic fiber cloth etc. The high-quality goods and good service we displayed on the international fair did great help for our agent to exploit Turkey market. Also, through some comparison at the fair, our Turkey customer had more confidence in us and became our CCE WOOL brands’ first agent in Istanbul. In 2013, we made a mistake and shipped ceramic fiber boards of wrong density. But when we realized this mistake, we tried our best to reduce our customer's loss, we told the customer this problem on the spot and then we began to make some negotiations. During the negotiation, our Turkey agent was willing to communicate with their end users and find out a reasonable solution. Finally, we agreed on a mutually satisfying compensation plan. This incident also enhanced the trust between us. In 2014, on MCE in Italy, we had an in-depth communication on how to protect their local customer source. They showed great satisfaction on our newly launched Customer Relationship Management System which could thoroughly protect the customer resource in Turkey and guarantee his benefit. We looked back on the past and looked forward to the future and agreed to extend our cooperation. Besides that, they exchange their opinion on ceramic fiber market and Chinese supplier. They finally came to a consensus that the only way to protect your market was to treat quality as the highest priority of a brand. At the same time, they showed their appreciation on the constant quality of our CCE WOOL brand through all these years of cooperation and they said that they would display all our ceramic fiber products on the Turkey fair this year. This in-depth communication strengthened our relationship. CCEWOOL Ceramic fiber module was made of our self-produced ceramic fiber blanket, which could ensure the stable quality of our products.Daily output is up to 5,000.0. Packing: Carton box.Our carton box is made of five layers of kraft paper, which is well suited for long distance shipments. The green package design shows the environmental protection idea and that are enjoying great popularity among the customer. So far, we already have 10 years’ export experience and have exported to more than 30 countries and regions worldwide, including Germany, France, Italy, Japan, North America and some African countries. Double Egret provides professional CRM system to every agent to realize systematic management and protect agents’ customer resources. Agents can get rid of any concern by our regional agent protection and guarantee of customers’ profit. From 2009 to 2015, Double Egret has continuously attended METEC in Dusseldorf Germany, CERAMITEC in Munich Germany, ANKIROS in Istanbul Turkey, METAL EXPO in Russia, AISTECH in America, INDO METAL in Indonesia, TECNARGILLA in Italy, METAL in Poland. 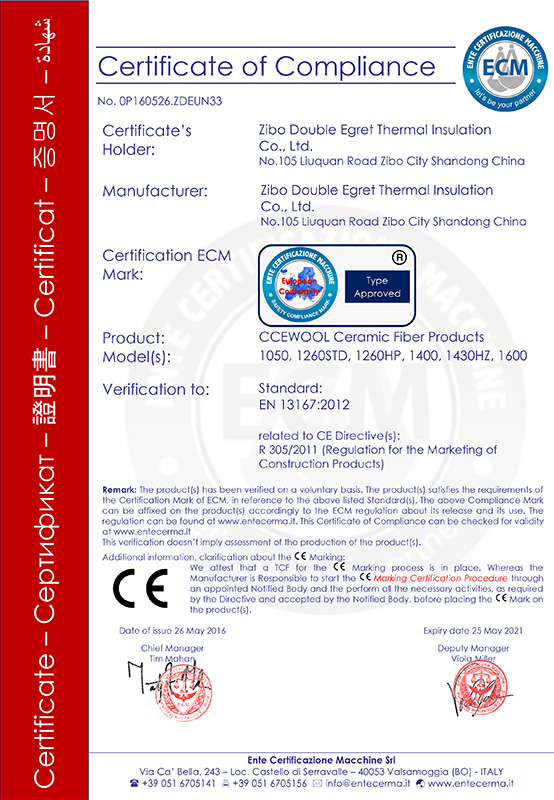 All the attendance has not only improved CCEWOOL brand reputation but also has witnessed customers’ approval and recognition of CCEWOOL quality. By virtue of brand strength and product quality, CCEWOOL obtains high attention and acceptance from visitors and exhibiting companies. More than 10 years’ export experience and professional document-operation team enable us to be familiar with many countries’ import-export policies and regulations, such as policies in some European and American countries as well as Soncapc in Nigeria. We will provide reasonable solutions to all problems concerning the products within 24 hours after customers pick up the goods. 10 years’ hard work has enhanced CCEWOOL brand popularity and reputation at the international ceramic fiber market. And we are keeping good cooperation relationships with many multinational corporations, such as Rath, Vesuvius, Calderys and Mobil etc.